Pinta is a free, open source drawing/editing program modeled after Paint.NET. Its goal is to provide users with a simple yet powerful way to draw and manipulate images on Linux, Mac, and Windows. Pinta 1.4 has just been released with new features, improvements and many bug fixes. This simple tutorial will show you how to install it on Ubuntu 12.04, 12.10, and 11.10 from PPA. Magic Wand tool selection modes (Union, Exclude, Xor, and Intersect). Reduced memory usage in the Open Images Pad (over 100mb in some cases). Copy/Paste support for the text tool. from a single layer or the entire image. clipboard, instead of just the current layer. Added a drop shadow to the canvas. any tools/effects that were registered. Downloads from remote repositories are now enabled. 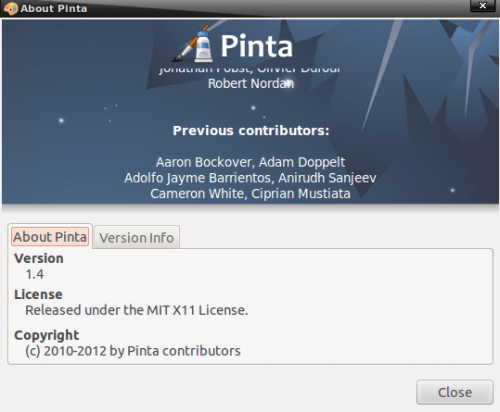 No user responded in " Pinta 1.4 Released: Install it on Ubuntu 12.04 & 12.10 "